In practice, is there a reason why the Parikh–Doering might be favoured over the Swern (DMSO activation with oxalyl chloride), or is it simply a case of "we just got better yields with it"? I checked in Kurti–Czako. No hints were offered, but they also did list two more Swern variants, namely Pfitzner–Moffatt (activation with a carbodiimide) and Albright–Goldman (activation with an acid anhydride). On top of that, as Jan mentioned in a comment, there is also the Corey–Kim oxidation where N-chlorosuccinimide is used to generate the chlorosulfonium salt from DMS (instead of DMSO). In general: are there benefits or drawbacks that are specific to each variant that would influence a synthetic chemist's decision, and if so, what are they? Swern and Parikh–Doering are by far the most practically useful and widely used oxidations. Whilst both have slight differences, the reality is that most research groups have a preference. This may be because they just have the reagents on hand (distilled oxalyl chloride vs good quality sulfur trioxide–pyridine), or because someone had a bad experience with one over the other. The Anderson group (in the post you linked) commonly uses the Parikh–Doering conditions, whilst other groups appear to favour the Swern conditions using oxalyl chloride in place of sulfur trioxide–pyridine. 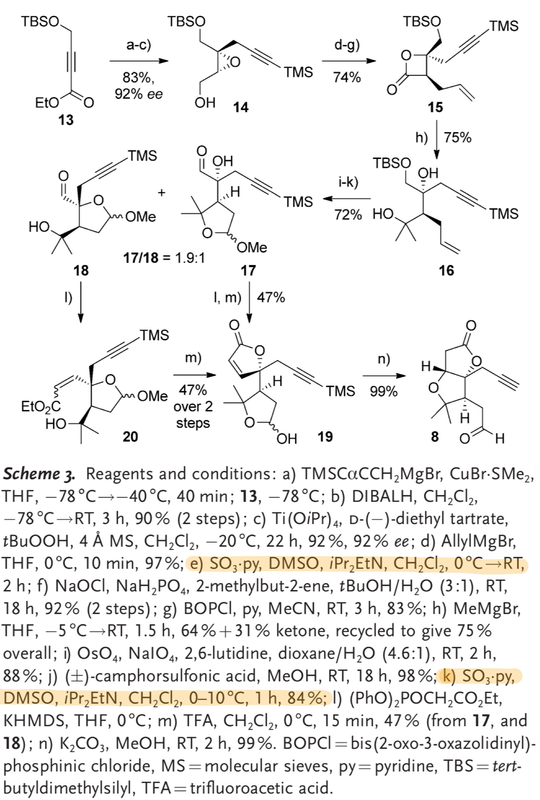 One thing to mention about all of these DMSO based reactions is the formation of stoichiometric dimethylsulfide (stench) as a by-product, which increasingly makes them avoided, especially by process chemists. That said, the reagents are cheap (compared to a Dess–Martin, for example), and the reaction is generally very reliable and amenable to use on moderate scales. The DMSO and triethylamine must also be distilled for optimal results (which can be a drawback, especially if large scales are needed). Reference: Pfitzner, K.; E.; Moffatt, J. G. A New and Selective Oxidation of Alcohols. J. Am. Chem. Soc. 1963, 85 (19), 3027–3028. DOI: 10.1021/ja00902a036. The Moffatt oxidation was one of the earliest examples of a DMSO-mediated oxidation. Two issues generally exist. Firstly, a strong acid (polyphosphoric acid, TFA, etc.) is required to get the reaction going, and, although the reaction becomes basic as it proceeds, the initial conditions using polyphosphoric acid/similar quite often have unwanted side effects (stripping of protecting groups, from experience). Secondly, and more importantly from a scale point of view is the stoichiometric N,N'-dicyclohexylurea produced as a by-product (similar to the Steglich esterification). Due to the difficult-to-remove stoichiometric by-products, and the harsher conditions, Moffatt oxidations have largely been forgotten/ignored. Reagents such as EDCI have been introduced, however the high cost relative to oxalyl chloride/sulfur trioxide–pyridine have limited the appeal of Moffatt oxidations. Reference: Albright, J. D.; Goldman, L. Dimethyl Sulfoxide-Acid Anhydride Mixtures. New Reagents for Oxidation of Alcohols. J. Am. Chem. Soc. 1965, 87 (18), 4214–4216. DOI: 10.1021/ja01096a055. The Albright–Goldman oxidation commonly uses acetic anhydride, and goes at room temperature - although with significant reaction times which can give side reactions time to occur. The biggest drawback, and reason why the Albright–Goldman is rarely used, is due to a competing Pummerer reaction (which is often significant), along with protection of the alcohol as its acetate ester if unhindered. Some improvements have been made using TFAA in place of acetic anhydride. However, mixing TFAA and DMSO causes a violent exotherm unless the temperature is carefully and cautiously controlled. Reference: Parikh, J. R.; Doering, W. v. E. Sulfur trioxide in the oxidation of alcohols by dimethyl sulfoxide. J. Am. Chem. Soc. 1967, 89 (21), 5505–5507. DOI: 10.1021/ja00997a067. Along with the Swern (see below), the Parikh–Doering is one of the most widely used DMSO based oxidations, with many examples in the synthetic literature. The Parikh–Doering is able to be ran at mild temperatures (0 °C to room temperature), and the by-products are easily removed (crashing out and filtration). One advantage to the Parikh–Doering over the Swern is the fact that sulfur trioxide–pyridine is a bench stable solid, compared to oxalyl chloride which is a liquid that must be distilled and stored in the freezer to prevent degradation. Reference: Omura, K.; Swern, D. Oxidation of alcohols by “activated” dimethyl sulfoxide. a preparative, steric and mechanistic study. Tetrahedron 1978, 34 (11), 1651–1660. DOI: 10.1016/0040-4020(78)80197-5. The Swern is the newest of the widely used DMSO oxidations, and often represents the best combination of reliability, cost of reagents, and ease of reaction. Unlike the Parikh–Doering, the initial stages of the reaction must be ran at −78 °C to avoid unwanted decomposition. However, the conditions are equally as mild. One advantage over the Parikh–Doering is that oxalyl chloride decomposes into gaseous by-products, meaning that the only thing needed to be removed is the hydrochloride salt of triethylamine. Swern reactions can often be filtered, concentrated, and telescoped into the subsequent reaction without attrition in yield. The majority of the chemical information here comes from Comprehensive Organic Synthesis, Vol. 7. A whole chapter is dedicated to DMSO based oxidations and their examples in total synthesis: see Lee, T. V. Oxidation Adjacent to Oxygen of Alcohols by Activated DMSO Methods. DOI: 10.1016/B978-0-08-052349-1.00191-8. Not the answer you're looking for? Browse other questions tagged organic-chemistry experimental-chemistry redox synthesis alcohols or ask your own question. What is the reaction between oxalic acid and potassium permanganate? What are the main differences of CTAB and DTAB surfactants? And what are practical applications of them? Are titration, recrystallisation, functional group analysis, etc. outdated? What are the differences and similarities between an aliphatic and an alicyclic compound? What are the ways to abiogenically synthetesize Uric acid? What are the intermolecular forces between polychloroethylene?